So at last Sundays “meet your neighbors” brunch (which I mentioned here), I met a neighbor. She had just recently moved to Miami from out of state, and she works from home. She’s considering getting a different job just so she can have an office to go to, to help meet people. I asked if she had joined any meetup groups. I tried doing meetup in Tucson, but the pickings were slim. Miami has a plethora, though. Name a hobby, sport, ethnicity, language or area of town and you will find a meetup for it. There is a meetup group for open mic performers (440 members). For bronies (345 members). For pug owners (444 members), French bulldog owners (406 members) and chihuahua owners (351 members). For watching Bollywood movies (1,221 members. Make that 1,222 now that I know this meetup exists). She said she had joined one or two, but they weren’t doing much. So I told her about one that a friend of a friend had started. It’s called Friendship and Fun, and the organizer plans a lot of really fun activities. I showed her a few of the outings scheduled and said I would also try to set up a lunch with my friend, so she would know someone in the group. We had the lunch today. We decided to go to an Indian restaurant for lunch. They were actually playing a Bollywood movie on a tv there and I kept getting distracted as I watched it. The clothes! The dancing! It’s easy to see why that meetup has 1221 1222 members. The server gave us a lunch specials sheet and a regular menu. So after choosing my lunch I looked through the regular menu, to see what they offer for dinner. It was a little pricey, but they had a really nice selection. Definitely worth coming back to, if lunch was good. Then I saw it. The kids menu. Which was comprised of chicken nuggets, cheese pizza and fish sticks. In an INDIAN restaurant! There was no kids tandoori chicken option. No kids murg saag (chicken with ginger and garlic). No shrimp in a tomato sauce. None of anything that was offered on the FOUR proceeding pages. I hate when restaurants only offer stereotypical “kid food”. And based on how mine and my friends kids eat, I can’t believe it’s necessary. 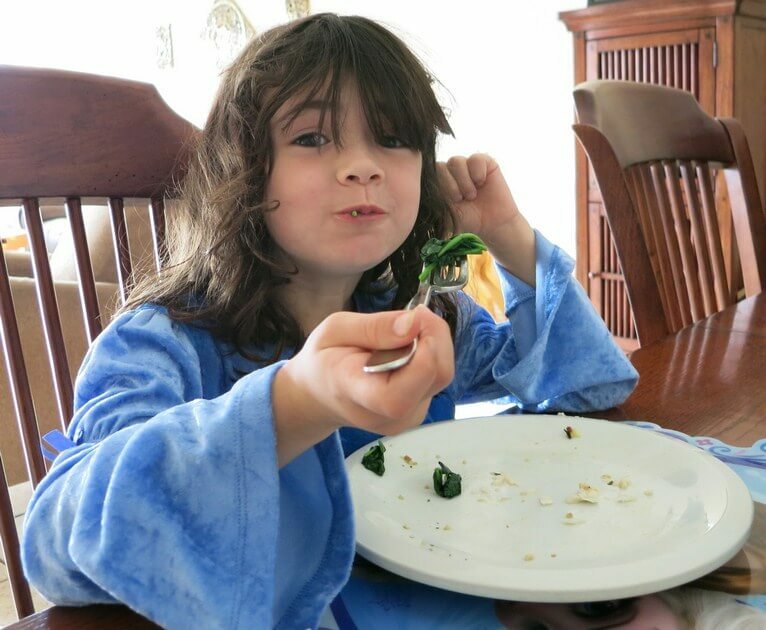 We take our kids for sushi, for Chinese, for Mediterranean, and yes, for Indian. And they eat it. And like it. Averi also LOVES seafood. Shrimp, mussels, salmon, and especially tilapia. So, I decided to make fish tonight, as a known only to me (and now you) passive aggressive way to counter the cheese pizza. I made Rachel Ray’s Parmesan Tilapia. It’s pretty basic, with just Parmesan and some spices, baked, so that you get a nice crust on it. Averi ate her piece immediately, and then asked for a second piece. I had to tell her she had to eat the rest of her food first. So she ate her raw spinach, my cooked spinach and some of Michaels cooked spinach. Then I gave her a second piece of fish. Which she hoovered down, then asked me to make her more spinach. So I did. By the time she was done she had eaten more than both Michael and I. Check out that clean plate and happy face. Take that Indian restaurant. 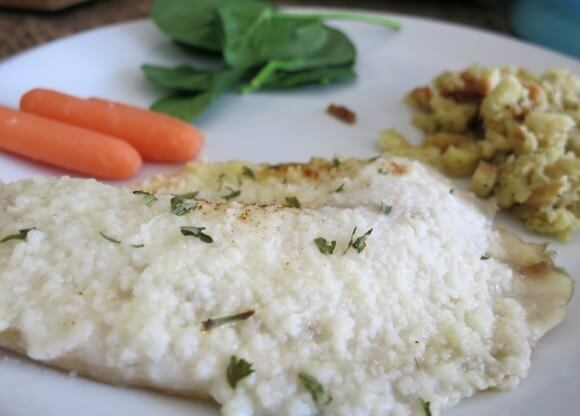 Place fish in baking pan*. Drizzle olive oil over fish, rubbing it all over the fish. 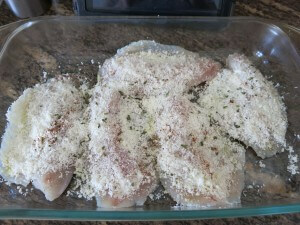 Shake Parmesan over fish, coating evenly. Sprinkle paprika and parsley over Parmesan. Bake for 15 minutes. If want, Rachel Ray recommends serving with lemon slices. I never do this and don’t feel I’m missing anything. * This is my lazy, minimal clean up way. Rachel would have you combine the cheese and seasonings in a bowl, then dredge the oil rubbed fish through the bowl, before placing in the baking pan. It’s your call which way you’re comfortable.